Carolyn Newberger is an artist, child psychologist, writer, and musician whose deep concerns for people and their lives drive her work. 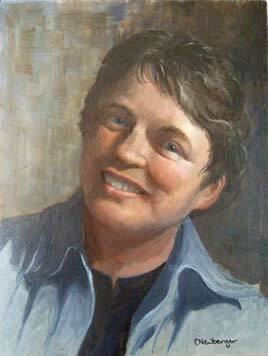 Her drawings, paintings and collage have achieved recognition and awards in juried and solo exhibitions. More recently, often with her husband, Eli Newberger, she has been writing and illustrating essays and performance reviews for The Berkshire Edge, a newspaper of arts and ideas in the Berkshires. As a psychologist, Carolyn developed an influential theory of parental consciousness that continues to frame family studies and efforts to prevent child abuse. Her research and teaching at Harvard Medical School and Boston Children’s Hospital, and her ability clearly and soundly to address such subjects as parental discipline, sexual abuse, and domestic violence, attract respect and notice by clinicians and media alike. Called often as an expert on television news, she appeared twice on the Oprah Winfrey show and has published widely in both the scientific and popular press. Click here for a 2002 interview on NECN’s “Newsnight,” where SNAP’s Phil Saviano and Carolyn Newberger discuss sexual abuse by priests in the Catholic Church. Carolyn studied flute with the legendary masters Bernard Goldberg, Samuel Baron, and James Pappoutsakis, and now performs with Eli Newberger and Mike Roylance, the Principal Tuba of the Boston Symphony, in the Cupcake Philharmonic Orchestra, a sextet that features performances of “Tubby the Tuba” in such venues as Tanglewood in Lenox, MA, the Boston Public Library, and schools in Massachusetts and beyond. She also plays jazz washboard with her husband’s band, Eli and the Hot 6. A signature member of the New England Watercolor Society, Carolyn’s art is represented by Galatea Fine Art in Boston, Massachusetts, The Artful Mind Gallery in Lenox, MA and by the 510 Warren Street Gallery in Hudson, New York.